Displacement map of Mexico City metropolitan area for 2000. 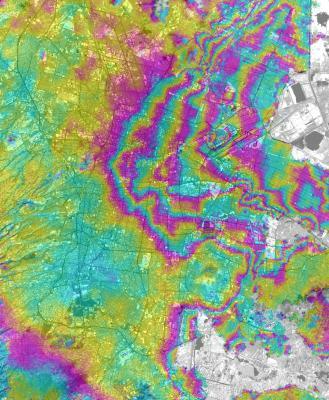 InSAR and GPS measurements indicate land subsidence in Mexico City at rates as high as 38 cm/yr, one of the the highest subsidence rates measured with modern techniques over a large urban area. Measured rates of subsidence are close to historical maximum levels of the mid 20th century, when mitigation efforts were first undertaken to reduce damage to urban infrastructure. However the locus of maximum subsidence has shifted east from the old city center. Many urban areas are subsiding due to withdrawal of ground water or other fluids (oil, natural gas).For certain types of aquifer, if the subsidence process goes on long enough, permanent loss of porosity may result.This means that the acquifer is permanently damaged, in the sense that it can no longer undergo natural recharge from surface waters.Figure 4.1 shows in InSAR image of Mexico City, which is undergoing rapid subsidence due to ground water withdrawal.Other areas, including parts of New Orleans, are subsiding due to dessication and oxidation of organic-rich soils that were originally marsh deposits, subsequently drained to facilitate urban development. The Geodesy Lab uses a combination of InSAR, PSInSAR, and GPS to study subsidence. Often, the spatial and temporal patterns of subsidence may give clues to the nature and reasons for subsidence, and help mitigate natural (amd man-made) hazard. Our recent study of New Orleans using PSInSAR [Dixon et al., 2006] showed that certain levees are subsiding at high rates, possibly contributing to their failure during Hurricane Katrina on August 29, 2005.